The legendary Huddie Ledbetter (January 29, 1885 - December 6, 1949); the larger than life black American folk singer; expert twelve string guitar player, with a claimed repertoire of some 500 songs; onetime companion of bluesman Blind Lemon Jefferson; a long-time inmate of Southern penitentiaries; and later darling of the East coast white liberal establishment. Raconteur, womanizer, brawler, braggart, and in latter days, a devotee of left-wing causes. The number one man on the number one gang, on the number one farm in the state - Pete Seeger [cycad.com]. Leadbelly's performances radiated an overwhelming intensity that few artists have ever matched. His recordings were instrumental in the creation of Britain's Skiffle movement. Harry Shapiro (author) - What Cyril really wanted to do was to play country blues. 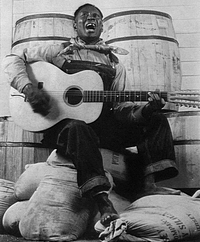 He was absolutely fixated with Leadbelly and although the sparce and poorly recorded surviving records really don't do him justice, his rendition of Leadbelly songs was spine-chilling. John Ross Twiston (R.T.) Davies [1927 - 2004] was a jazz multi-instrumentalist and discographer. John R.T. Davies' name became familiar to jazz fans as that of one of the leading transfer engineers. His work restoring old 78's for CD reissues is still the best there is, on various small labels all over the world. While in school, John had played drums and during army service, guitar; he also worked with George Melly, Mick Mulligan and others, taking up trombone in '49, and alto sax in '54. John recorded a couple of sessions of the Steve Lane band in 1952, when he was playing in it (with Cyril?). I recorded a lot of other bands that I wasn't in, mainly at the behest of Doug Dobell, the owner of the famous Dobell's jazz record shop in London, a meeting place for jazz aficionados and record collectors. Doug marketed these records from his shop, under the "77" label (77 Charing Cross Road being the shop's address). They didn't appear for sale anywhere else. We were faced with a big problem because of purchase tax, which stipulated that you could produce a hundred copies and not pay any purchase tax but if you produced a hundred and one you'd have to pay tax on the lot. So many of those records only ran to a hundred copies, but this was usually enough to satisfy the immediate demand. 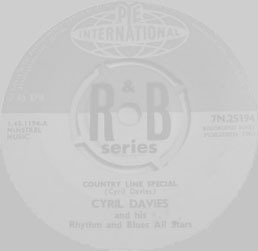 On February 13, 1957, Cyril and Alexis (with fellow musicians, Terry Plant & Mike Collins) made their tentative debut as partners on Blues From The Roundhouse; recorded by John R.T. Davies and produced by Brian Harvey, this recording was done under the supervision of Doug Dobell and issued on his tiny "77" label. We asked the Producer, Brian Harvey, about these sessions in September 2004 - It is so long ago, that I remember very little about that period. I recall wanting to record Alexis, but mainly for his superb guitar picking and I was considerably put out that when it came time to record he insisted on singing - badly - well to my ears at least. Also recorded by the group at the February 13, 1957 session was another version of the Cripple Clarence Lofton tune, Streamline Train. Alexis had recorded a version of the same song in 1955 with Ken Colyer. This song, with Cyril on guitar & harmonica, would go unreleased until 1984. It finally saw the light of day on the Krazy Kat compilation Alexis 1957. 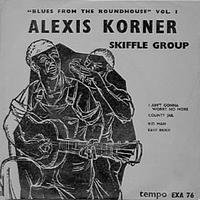 The next group release was recorded on July 22, 1957 under the auspicious group name 'Alexis Korner Skiffle Group' on Tempo Records. 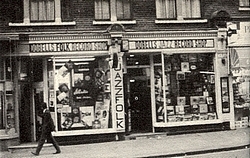 Tempo Records was a jazz subsidiary of British Decca. In the late 'forties and early 'fifties musicians working in the revivalist idiom recorded for the marque. From about 1955, modernists such as Jimmy Deuchar, Tubby Hayes and Dizzy Reece were recorded. Alexis authored several press articles between '56 - '58, distancing himself from the Skiffle movement. The group now featured Alexis (vocals/acoustic guitar), Cyril (acoustic guitar / harmonica / vocals), Chris Capon (string bass), Mike Collins (washboard) and Dave Stevens (piano). Dave recently recalled (2006) his initial meeting of Alexis Korner - It might have been when we played together in Chris Barber's first band, the one with two trumpets." Dave and Alexis had played half hour sets of 'race blues' earlier in the 50's with Chris Barber (bass) and Brian Laws (drums). Dicky Hawdon (trumpet), Alexis (guitar), Colin Thompson (clarinet & soprano), Denny Coffey (bass) & Dave Stevens on piano cut a demo [Sportin' Life/Monday Date] disc at a Denmark Street studio in order to get a broadcast on Jazz Club. Dave also had played piano in a couple of incarnations of Beryl's Backroom Boys - You probably know I played with "Beryl's Backroom Boys. The trumpeter was Allan Wickham, and Owen Maddock was on tuba. Beryl was a lovely person and a great entertainer. She sang a lot of blues and Billie Holiday songs and played washboard. But skiffle(? ), I don't even know what it is! Of interesting note is this EP, Muddy Waters (with Little Walter), Mississippi Blues [UK VOGUE Records Tri-centre EPV 1046 (1955)] features not only the same cover art(!) as Alexis Korner Skiffle Group but also liner notes by Alexis. Disques Vogue was founded in France in 1947. They originally specialized in jazz recordings, featuring such artists as Sidney Bechet, Django Reinhardt, Dizzy Gillespie, Lionel Hampton, and Errol Garner. In the late 1950s Vogue expanded into pop music, recording Petula Clark and other popular singers of the era. The label's United Kingdom sister label was Pye Nixa Records. As evidenced above, Muddy Waters was definitely on the British musical radar. 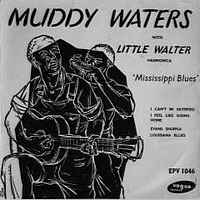 While (during 1957 and '58) Cyril remained true to his total identification with the acoustic Leadbelly, the music of Muddy Waters (helped by the harmonica styles of Little Walter and James Cotton) would eventually lead Cyril in a personal pursuit of that tough Chicago Style electric blues. This blues mission needed only a catalyst to bring these forces together - this catalyst was the iconic Chris Barber!